I started this 12 week training schedule for my run in September with a run through a rainy night in Sydney. It was the wettest I have seen Sydney, or at least the wettest I have seen the area near Lidcombe, since moving there in August last year, measured by the run-off on the ground. 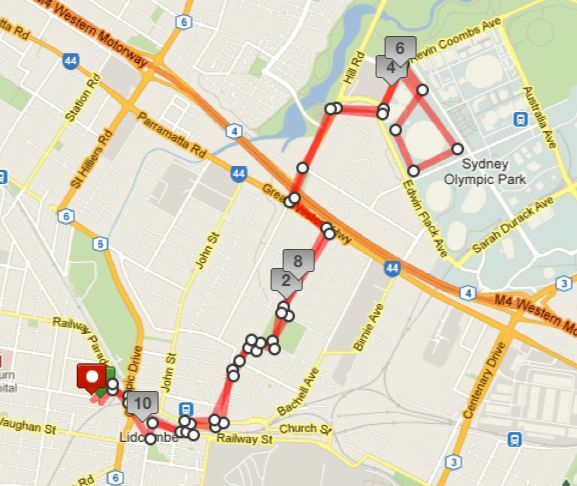 The course took me around the Sydney Olympic Park crossing Parramatta Road and back again. The next two days were in Canberra. Last night with sprints along Anzac Parade late into the evening, and tonight in the excellent gymnasium at the Australian Defence Force Academy on the running machine. Feeling good for the journey ahead. Could be a little better conditioned, and a few kg heavier than my ideal training weight which will drop over the next four to six weeks, particularly important as I pick up the distance. This entry was posted in 10 City Bridge Run, Inspiration, Training log and tagged Lidcombe, Training. It looks an interesting and challenging course and I hope that it doesn’t bucket rain as it did when I was in Sydney. As your mother would say ‘be careful when you cross the road’. I look forward to further input. With each request for aid from Salvation Army, Anglicare, etc, I give thanks to God for what you are doing, it certainly is an amazing project. Congratulations to you Matt.